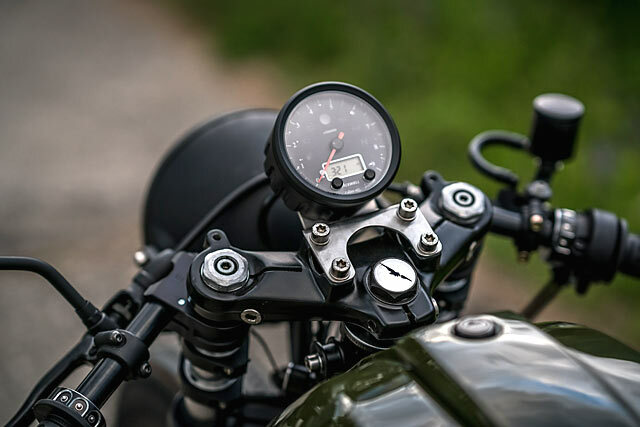 In the earliest days of the motorcycle the engine was everything. Many of the frames were indistinguishable from a bicycle, it was all about the power plant. Inventors tried steam, diesel, electricity and petrol to make their motors rev and experimented with a host of technologies to improve power and reliability. These days you can barely distinguish one new engine from another, apart from the number of cylinders and the cosmetic dress ups. 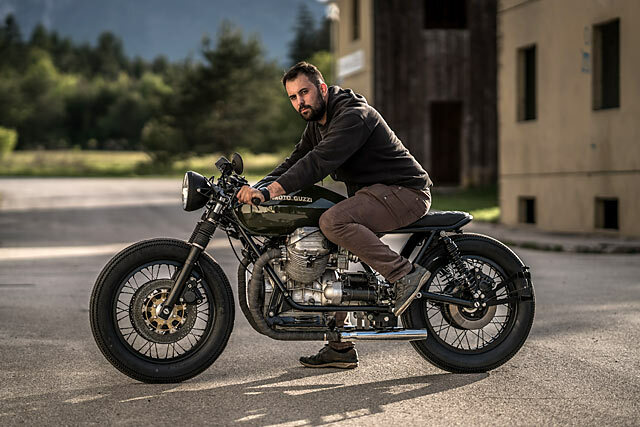 But David Widmann and his crew from NCT Motorcycles in the Austrian Alps take the mechanical side of things very seriously. 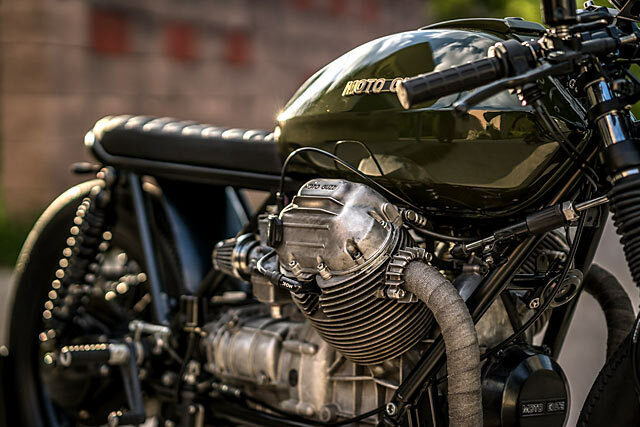 For one lucky customer they’ve turned a 1982 Moto Guzzi 850 T4 into a true classic motorcycle. Its looks are great, but it’s the engine that’s the centerfold. There is no doubt that NCT has a distinctive style of their own, but they take great pride in truly delivering on a customer’s desire. It makes sense that to stay in business and survive, you have to keep the people handing over the folding stuff happy. 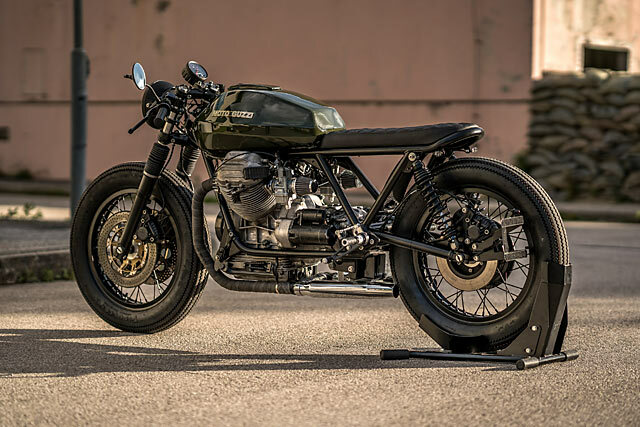 Thankfully the owner of this Guzzi knew exactly what he wanted and David could instantly see the appeal. 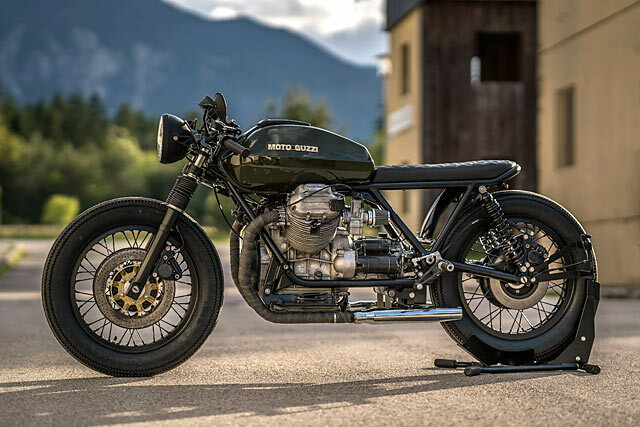 Pull the gaudy ’80s clothes off the 850 and accentuate the beauty of that classic Moto Guzzi drivetrain into a cafe racer with just a little brat attitude. 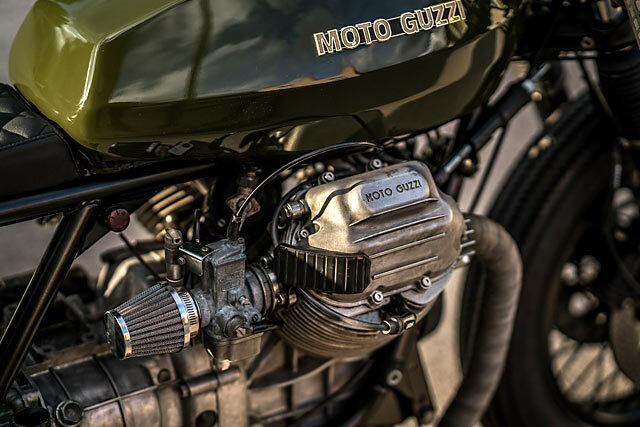 The Guzzi is build number 32 for the NCT team and was delivered to the shop by the owner in a full factory fairing that luckily would never survive. Some of the T4’s even came with a modern style full fairing with just the airheads poking through; they looked bad then and horrific now. But as NCT got to stripping the bike back to a bare frame, the fairings would find a home in the nearest bin. With the engine out and every component stripped down, the frame was up on the bench with Manuel and his grinder close behind. All unnecessary tabs and brackets were removed and you have to look closely to appreciate just how much time was spent smoothing the metal out. With a cutting wheel swapped into the grinder the subframe was trimmed off and Manuel set about crafting a new rear section. Perfectly following the lines of the frame and matching the beautiful factory welds the lines are simple, yet exquisite. With the bulky rear fender shown the door, a neat hugger-style fender has been shaped and neatly affixed under the seat. There is no upper fender but the up-kicked rear finishes out along the axle line for a truly classic look. There is no front fender either. Clutch your pearls! This is a machine that transports you back to man, motor and mud being a truly great day out. But to get those classic looks it could never be achieved with the stock ’80s alloy rims, a fashion trend best forgotten. As Felix explains, “What we liked best is also the thing that was the hardest part of the build – the rims.” To convert the alloy shaft drive hub to a spoked wheel is not an easy task and requires the special machining of various parts and spacers. But it’s more than worth it with front and rear using Borrani rims and spokes to finish out the look. The wheels are shod in Firestone rubber that only helps to transport the looks back in time. Felix delves further into the design philosophy “All in all it was important to create a minimalistic look. The idea for the design came from the owner, but David optimised it for a better general appearance.” This meant that whatever bodywork went back on had to be flawless and Manuel spent a good deal of time making sure the tanks metalwork was arrow straight. He then mixed up a classic green and laid down the paint to perfection so that even the solid hue gives a mirror shine. 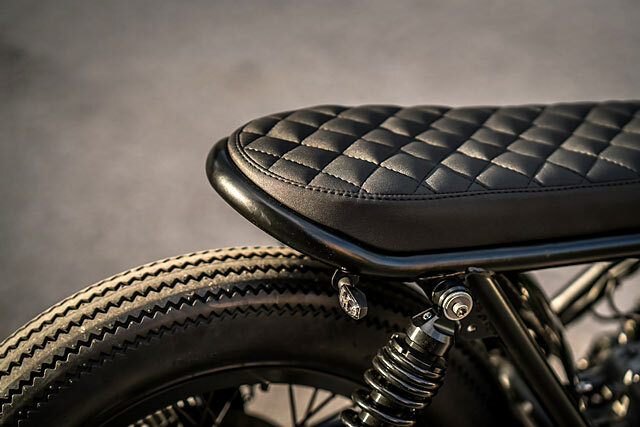 The seat compliments the entire look of the bike with plenty of room to move on the diamond stitched black leather number. Then there is that engine, a mechanical masterpiece with a few clever touches that give a certain je ne sais quoi that is better looked at than described. The big 90° V-Twin has been given a full internal rebuild, restoring that freight train like pull from the torquey 844cc’s. On the outside, the cases and barrels have been cleaned, but no polishing or paint allows the character to really shine through. David had a clever trick up his sleeve; new intake mounts now point the Dell’Orto carbs directly rearward, instantly creating a tougher appearance. Simplifying the pipe work, the exhaust headers run straight back, heat wrapped, to twin chrome mufflers. Getting that power to the ground and creating a tighter handling package happens in more ways than just the suspension upgrades. The rear benefits from a re-alignment of the shock mounts on the frame before a set of adjustable progressive rate spring over shocks were fitted. 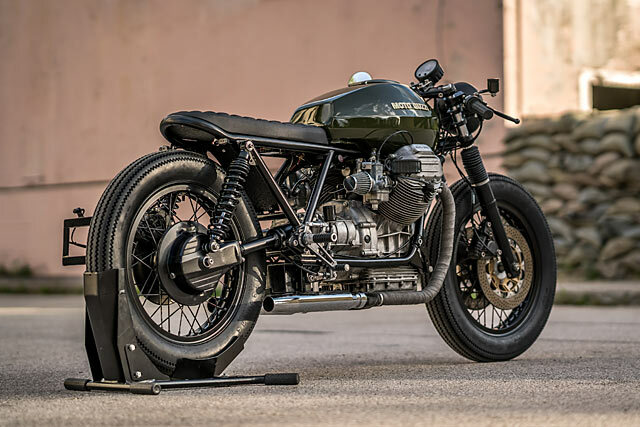 Up front, lowered Paioli forks keep the weight on the front tyre and the Guzzi holds a line like it’s on rails. The factory Brembo braking hardware gets an upgrade with new lines, rebuilt calipers and a change to drilled discs; all of which ensure a firm feel through the lever. 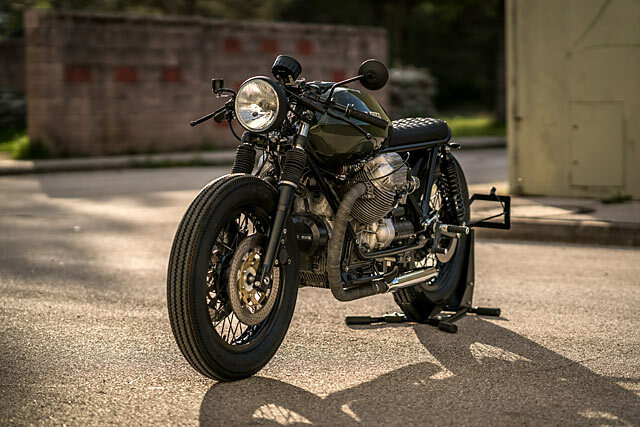 The riding position is considerably more cafe racer than anything like the sit up and beg touring package offered by the factory. The Italian rearsets are positioned further back next to the swingarm pivot point, with new linkages fabricated in-house. While the clip-on bars with a big bucket headlight and a single round mirror complete the look. Having spent so much time transforming the bike into a minimalist machine the best way to handle the electrics was with Motogadget. An M-unit controls the show with switches, bar end indicators and a single speedo from Acewell rounding out the show. 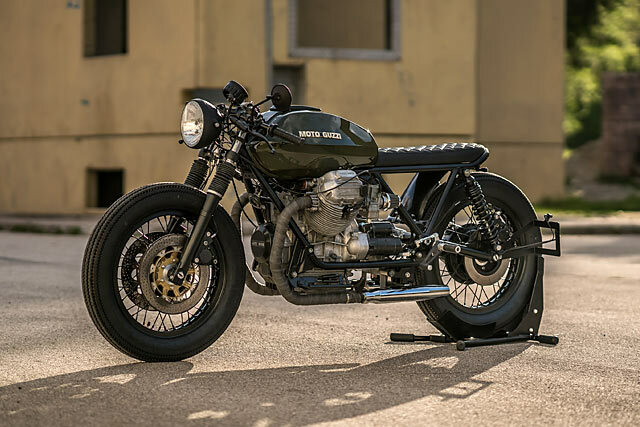 Very few bikes find the balance between form and function so well and while the Firestones and pipe wrap might not be to everyone’s taste, if ever a bike pulled the look off, it’s this one. NCT also know what to do to keep their customers happy and a bike that looks this good, having started from such an average base, is a testament to their skill. 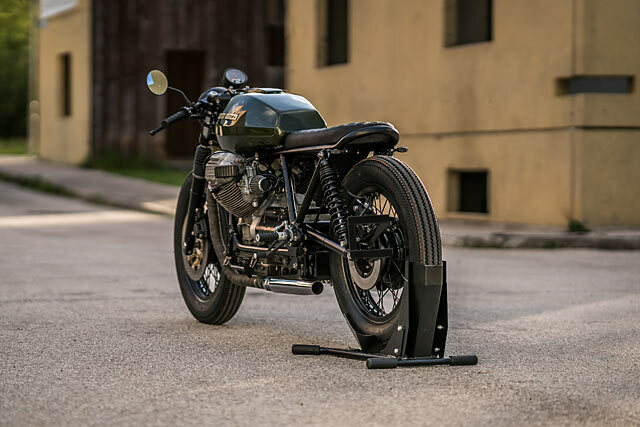 The fact it rips up the Austrian Alps with the V-Twin roaring like a lion is just the snow-capped peak on a very beautiful, mountain-made Moto Guzzi.